If the Sémondière was built under Henri IV, his reign was short, and we find distinctive element of Louis XIII style in its architecture, particularly its roof slates 11 meters high with its slope at 30 degrees. It was originally blind and it is only under the Empire that were drilled the 3 skylights shaped as "dog seated". The interior still has many aspect of provincial Louis XIII style. During this period, François de Brécey then his son Jacques who appears elsewhere in the archives as the first Mr. of Sémondière served in turn as the king lieutenants musketeers, and guards the king's door at the Louvre. We can imagine sharing their lives between Paris, which was then distant 5 days on horseback, and Brécey where they were resting and monitor the functioning of the agricultural sector as they were not serving the King, wherever they lived a quiet retirement. In all armies were found, from 1560, the musketeers, because they were equiped in 1622 by Louis XIII of what was a new weapon, a musket. They wore a blue casaque reserved for the elite corps of King, who proclaimed himself their captain. A company was composed of 250 men and had the primary mission of ensuring the safety of King following him everywhere. 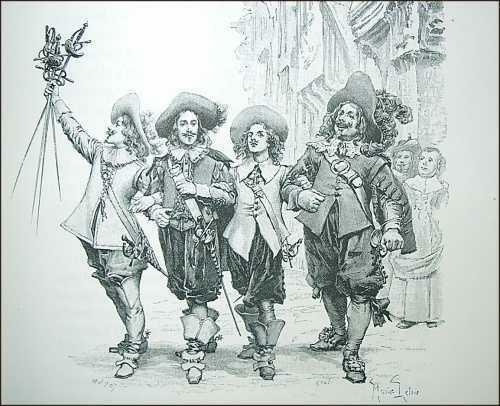 Cardinal Richelieu also wanted to have his personal guard of musketeers who were dressed in red. They were abolished in 1646, but the young King Louis XIV reformed them in 1657 and even create an additional company in 1664. The most famous of them thanks to Alexandre Dumas, was Lieutenant Charles de Batz, Count d'Artagnan who died in a combat in front of Maastricht in 1673, and was so esteemed by King Louis XIV that at his death, he and the "Dauphin" wanted, be guardians of his son.